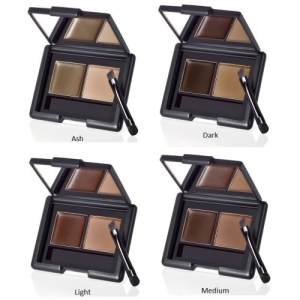 I’ve heard glowing reviews about ELF’s makeup and cosmetics range via beauty bloggers and fellow makeup geeks. ELF (short for Eyes, Lips, Face) is a well known makeup brand from the USA with a cheap price point, e.g. Under US$5 (in the USA). Being a bit of a beauty cheapskate, it’s been a real frustration to me that, up until last week, ELF has only been available to Kiwis via online shopping. A few months ago I heard an exciting rumor that ELF was coming to Kmart in New Zealand. That rumour turned out to be 100% true and, fast forward to now, ELF is established in most Kmart stores nationwide (albeit most stores have reportedly sold out already!). To show my dedication to you, lovely readers, I decided to do some research. 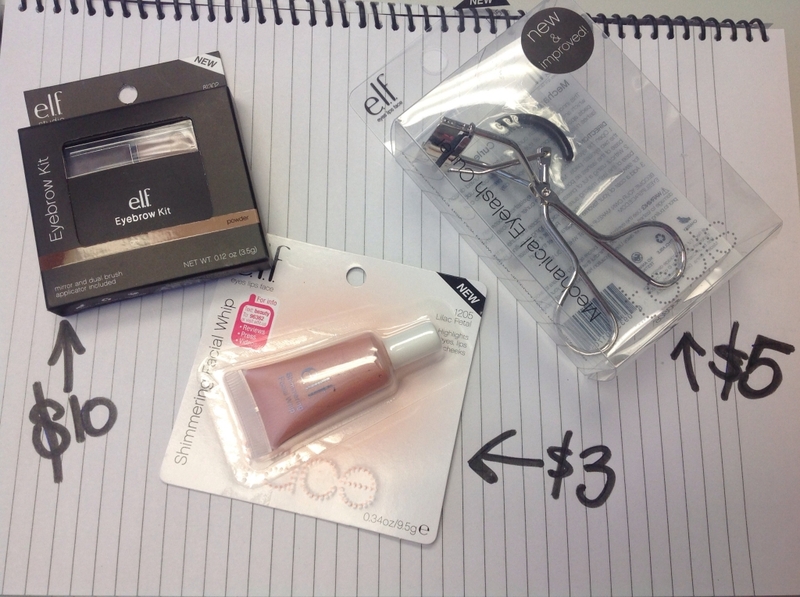 So, for the hefty sum of NZ$18 I purchased three items: An ‘Eyebrow Kit’, an eyelash curler and a tube of cream highlighter/shimmer. After all that hype, were these hit, or miss? I’ve been wanting this kit for ages as every beauty blogger and her mother raves about it. Now, you may recall I am a fan of Milani’s Brow Kit so my experience with ELF’s version was always going to be slightly reluctant as I am very loyal to my favourite products. Well, it pains me to say it – ELF’s eyebrow kit is better than the Milani equivalent. Why? The ELF version comes with a pigmented wax that you apply through your brows first then set the brow powder over the top. As a result, the powder has something to stick to and the product lasts all day (whereas my Milani one fades off). Oh, and the ELF kit is cheaper. The only downsides are: A) The wax contains Mineral Oil (Caroline Hirons won’t like that) and B) The brush it comes with needs to go straight in the bin, it’s hopeless. Use your own (I use my Mac 266 brush – it rocks). My verdict? HIT. Price: NZ$10. This is fantastic value given there are some brow kits out there that contain a shadow and wax for upwards of NZ$50. Being the Queen of Eyelash Curling I had to get this. The packaging tells me this is ‘new and improved’. Well, I’d hate to have used one of the unimproved version, this was absolute pants. It didn’t curl at all. I have tried it three different times (I even tried heating it up with a hairdryer, you know how I love that trick) = yeah nah. Hands down: Worst Eyelash Curler I’ve Ever Used and this has already been thrown out! I’ve had more success with eyelash curlers from the $2 shop. My Verdict? SERIOUS MISS. For $5 you should treat yourself and buy a coffee in a nice cafe and put your feet up. Price: NZ$5. This is an illuminating product and, using a ‘pearl size amount’ you apply it with your finger and blend onto cheeks, inner eye corner and lips. This gives a faint shimmer to the skin and is a great pick me up, especially if, like me, you wear a foundation most days and you can end up looking a little ‘flat’. According to the packaging this Shimmering Facial Whip will create ‘instantly beautiful, healthy-looking skin’. For NZ$3 I had very low hopes, particularly as I tried this out after the eyelash curler. Also, I’m a big fan of Benefit’s Highbeam which, in my opinion is ‘The Shizzle’ of all illuminators. What did I think? I was pleasantly surprised by: The subtle shimmer this gave to my skin, the non greasy formula, it lasts reasonably well. My Verdict? All things considered, especially the price point, I’ll give it a HIT. Price:NZ$3. By the way, if you don’t have super oily eyelids and are keen to try an eyelid primer, ELF have a good one, check out ‘Mineral Eye Primer’ (I think this is NZ$10 but don’t quote me on that!). If you are wondering what the heck an eyelid primer is, read this blog post! Have you tried out any ELF products? What’s a hit or miss for you?